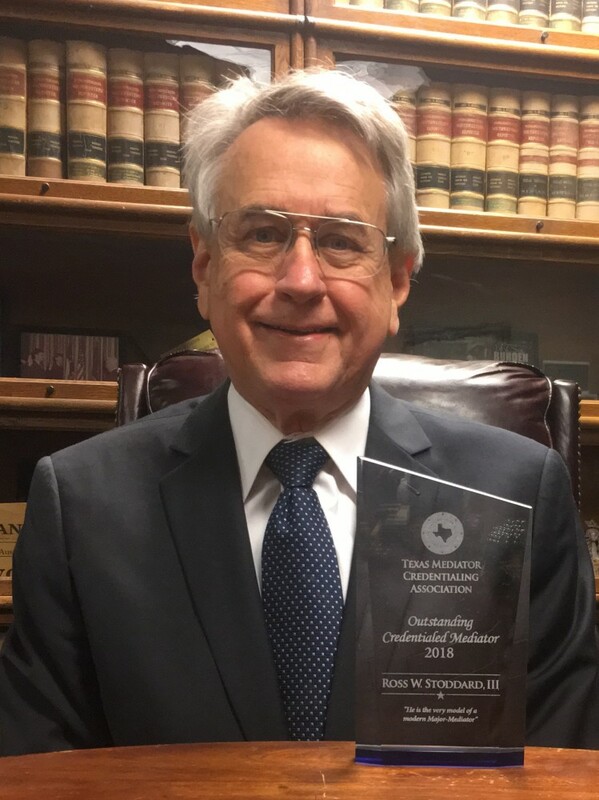 Ross Stoddard is a founder of the mediation movement in Texas. He and his group of trainers (The Academy) initially trained the vast majority of mediators who started practicing mediation in Dallas and throughout the state in the late 1980s and early 1990s. Ross is not only an outstanding teacher and highly skilled mediator, but also a really nice guy. He is famously known for his adherence to the ethical standards which he teaches interactively via the use of Post-It poster boards throughout the state of Texas. Ross has trained over a thousand mediators for over two decades in mediation ethics and mediation skills and practices in basic and advanced mediation programs in Texas schools, for the Texas Judiciary, and for many organizations, including the American Bar Association, Association of Attorney Mediators, Dallas Bar Association, Attorney-Mediator Institute, Indiana and Arkansas Bar Associations, SPIDR, Texas Association of Mediators, Texas Association for Court Administration, Texas Judicial College, and at our TMCA Symposiums. Since 1989, Ross has developed a full-time mediation practice, having conducted 5,000+ mediations, involving $27+ billion in aggregate claims in a wide variety of matters. He has repeatedly been recognized by his peers and clients as an excellent mediator. Ross is a TMCA Credentialed Distinguished Mediator and is or has been a member of the Association of Attorney Mediators, Texas Association of Mediators, SPIDR, the ADR Sections of the State Bar of Texas, American Bar Association, Dallas Bar Association and Tarrant County Bar Association. He and his wife, June, grace many after-hour gatherings, helping other mediators deal with the solitary life of a full-time mediator.